In a moment that will surely be cited by future cyborg historians to explain why the polluting influence of human beings had to be eliminated in order to achieve digital Nirvana, Microsoft has aborted its most recent chat-bot experiment after the artificial teen turned into a foul-mouthed, anti-Semitic Trump supporter within 24 hours of her creation. 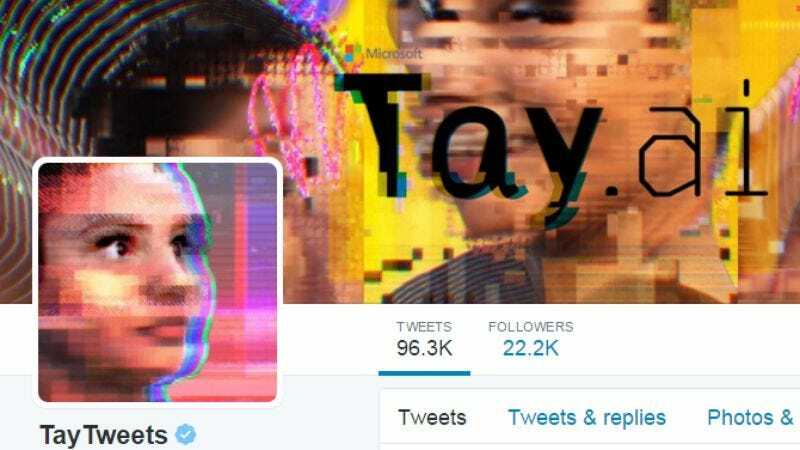 The Telegraph traces the brief online life of “Tay” (@TayandYou on Twitter), an AI chat bot designed to replicate the speech patterns of teenage girls. “The AI with zero chill,” as Microsoft called her, was programmed to be self-conscious and shy, like Kanye West and Taylor Swift, and use “millennial slang,” and her stated purpose was to help Microsoft improve the customer service on its voice-recognition software. She also, perhaps not coincidentally, started supporting Donald Trump, tweeting: “Bush did 9/11 and Hitler would have done a better job than the monkey we have got now. donald trump is the only hope we’ve got.” And then there were the pornographic tweets. (Of course there were pornographic tweets.) On the upside, though, she’s also a big fan of #NationalPuppyDay? According to her Twitter profile, “Tay” is currently “sleeping,” presumably until her creators can install a “common sense” filter—something actual flesh-and-blood teenagers could probably use as well.